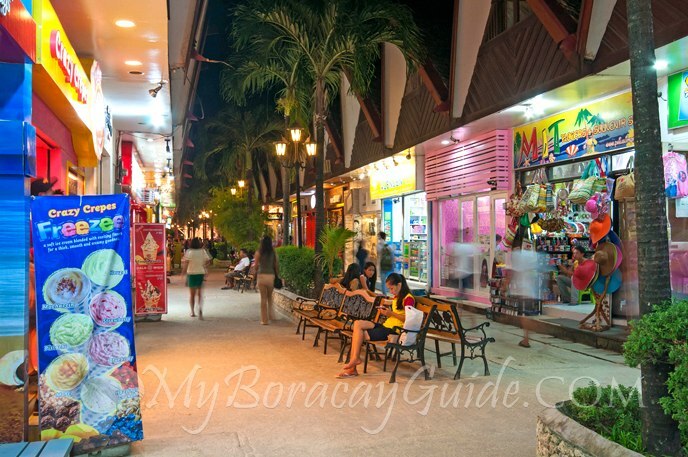 Are you looking to do a bit of shopping while in Boracay? Maybe just looking to pick up some daily needs items for your trip? D’Mall is likely where you should be headed. Boracay’s D’Mall is located roughly between Station 1 and Station 2. D’Mall is like a one-stop-shop open air market that is a bit more upscale than the Talipapa shopping area. You will find tourist related stuff here like beachwear, lamps, jewelry and native woodcarvings. It’s also the best place to shop for shirts, sarongs, tie-dyed stuff, key chains, and other souvenirs. Just Be prepared to pay tourist prices and do not be ashamed to haggle. Boracay’s D’Mall is also home to various restaurants like Aria, Cyma, Ole, Lemon Cafe and Hama. There are cheaper restaurants for those on a tight budget as well. There’s also a Delicatessen shop (Heidiland) with imported delicacies, a super market, money changers, spa, pharmacies, internet coffee shops, flight ticketing office , optical shop, dental shop, school supplies and ATMs. You will also find a mini park and a wall climbing facility in the heart of D’Mall. Your trip to Boracay is definitely incomplete without at least one visit to D’Mall. This entry was posted on 星期二, 二月 7th, 2017	at 7:08 下午	and is filed under 最近	. You can follow any responses to this entry through the RSS 2.0	feed. You can skip to the end and leave a response. Pinging is currently not allowed.